The Pink Panther is an achievement in showcasing utter awkwardness. In fact, one would swear that it is the essential element of the picture, despite how many other aspects make it transcended being a mere knee-slapper. It is apparent from the first few minutes that depict the iconic animated Pink Panther lying down and seeing the title form before his eyes, and looking confused when it says the ink ant. The lengthy credits sequence is indicative of the film itself, light, amusing, colourful and sometimes bemused at its own absurdity. The last emotion mentioned is showcased in one of the film’s best sequences in which a car chase between three cars is occurring. Two of the cars have men in monkey costumes, and the final one has the hapless Inspecter Clouseau dressed as a knight in shining armour. The whole ordeal is seen from the point of view of an old man who looks utterly confounded at what is happening around him. He almost represents the audience at that moment, watching a comedic car crash that we cannot look away from for a second. The farcical nature of the picture keeps the moral dimensions of the picture firmly in check, however, occasionally emotion seeps through the proceedings. The scene that encapsulates this well is when Sir Charles Litton (David Niven) is having a late night drink with Princess Dala. (Claudia Cardinale) Through the course of the scene, we see the pair bond, and the way Niven plays his part is striking. With just simple expressions, we can see the cogs turning in Litton’s head as he develops a fondness for this woman that he is spending time with through the course of the night. Cardinale is equally compelling, matching Niven with charm, a keen sense of humour and a razor-sharp wit that accentuates the scene between them both. 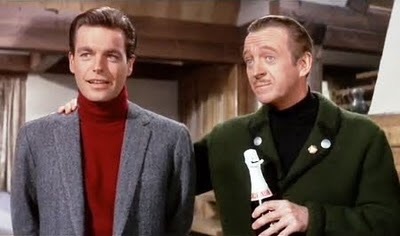 It is a key scene as later, Litton’s girlfriend, Simone Clouseau (Capucine) says to him that the number one rule of their profession is not to get emotionally attached to their victims. The scene above is the literal playing out of that idea, and both Niven and Cardinale were the big surprises of the picture. It was with this in mind that it was much to my bewilderment that Inspecter Clouseau (Peter Sellers) felt like a background character for most of the picture. However, when Sellers is on screen, much of the comedic sequences get elevated to something special. While, one can certainly cite many of his scenes as being excellent in their power to amuse. The best comes from a small moment in the closing minutes of the film. The ultimate punch line of the film has been delivered, which saw Clouseau charged with being the phantom that he was chasing throughout the film. Clouseau is in the car with two police officers, and they are asking him how he did his robberies. Sellers acts with great caution at first and then gives a slight sly smile saying it was not easy. The officers look horrified, and Sellers goes from looking subtlely smug to awkward. It is a great subtle comedic moment that ends the picture. Elsewhere, the film is visually breathtaking, providing many stunning shots of the European cities that are primarily showcased in the opening scenes. Finally, the score by Henry Mancini impresses in its ability to add a lightness of touch to the picture, particularly with its use of trumpets and light piano work.